Dr. Rock's Blog & Roll: Album of the Day: The Monkees (5/22/67) 43 Years! Album of the Day: The Monkees (5/22/67) 43 Years! Derided as the “Pre-Fab Four,” The Monkees suffered endless attacks on their credibility and capabilities as musicians following the release of their first two albums in 1966 and early 1967. Critics pointed out that the band – Mike Nesmith, Peter Tork, Micky Dolenz and Davy Jones – was assembled just for a TV show and could barely play their assigned instruments. That all changed quite quickly when Colgems issued The Monkees’ Headquarters on May 22, 1967. The band had demanded – and won – artistic control over their recordings, ousting creative supervisor Don Kirshner in the process. The four penned half the songs on the new album and performed nearly all of the instrumentation. Nesmith, Tork and Dolenz each contributed at least one notable track to the effort, and Jones joined the other three to write two songs credited to the band as a unit. Headquarters is an eclectic mix of Brill Building pop, Nesmith country-rockers, sappy Davy Jones ballads and a Dolenz original, “Randy Scouse Git,” that is as far from the happy-go-lucky sounds of “Last Train To Clarksville” as you’ll ever hear on a Monkees record. 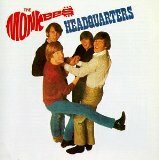 There isn’t a hit to be found on Headquarters, yet it’s the Monkees’ best all-around album. Headquarters hit #1 on the Billboard 200 chart in late May 1967 and was replaced at the top spot by Sgt. Pepper’s Lonely Hearts Club Band when it came out on June 1. Headquarters then spent 11 weeks in the #2 position. The Monkees are in the Playlist Vault and Headquarters is available on Amazon and iTunes.